Ever mindful of the historic backdrop for Antarctic voyaging, G.A.P. had included a history specialist on the expedition staff. The young Canadian historian Chris Gilbert had filled hours of our rocky passage across the Drake with harrowing tales of the “The Worst Antarctic Trips Ever.” One of these was the incredible story of the Swedish Nordenskjold party of 1902-1903. The scientific purpose of the expedition had been to put men ashore for the first observation of Antarctic winter conditions. After running into pack ice in the Weddell Sea, the expedition commander, geologist Otto Nordenskjold, had returned to a place called Snow Hill Island to spend the winter of 1902 with four other scientists and Jose Sobral, a young Argentine naval officer who had been detailed by his government to accompany the explorers. Their ship, the Antarctic, sailed away planning to return to pick them up the following spring. We had already encountered traces of this expedition at Esperanza, where three men had been forced to spend the winter of 1903 after their ship left them for a short reconnaissance mission, then sailed off and sank. These circumstances forced the original wintering party on Snow Hill to spend yet another winter. Miraculously, they were rescued in November 1903 when the Argentine ship Uruguay came in search of Lt. Sobral and his companions. Not only were the six men from Snow Hill plus the three castaways from Esperanza found safe, although malnourished and weakened by hardship, but the ship also picked up the crew of the sunken Antarctic, who had passed the winter in camp on Paulet Island. Through courageous leadership, physical endurance, and good survival skills, the expedition survived with the loss of only one man on Paulet Island. On December 22 our ship anchored off Snow Hill Island, where we proposed to be the first to land this season. We were cautioned that we shouldn’t count on anything. Previous attempts had been hampered by fast ice. But after breakfast Expedition Leader Brad announced that we would make landing at 9:00. He also cautioned us that once we were on shore we should be alert to signals for a quick departure. Weather conditions could change almost instantaneously. We loaded into zodiacs and crossed the icy bay to Snow Hill. I decided soon after scrambling ashore that Snow Hill was a misnomer, at least on this day. It could have been called Mud Hill as we sank almost to the tops of our boots in the sludge caused by melting snow. We found ourselves on a shore beneath a dramatic crenellated ridge that provided shelter to Antarctic cormorants and other seabirds. 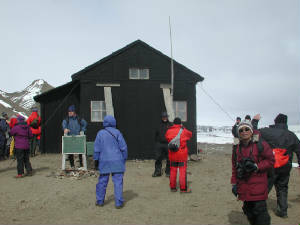 The historic hut was situated on a scenic point up the slope. We all climbed up to look inside and tried to imagine what it meant to spend an Antarctic winter here one hundred years ago. The prefabricated hut was snug and in surprisingly good condition, maintained as a historic site by the Argentine government, which had continued to take a proprietary interest in the area after the rescue of Lt. Sobral. The Swedes had prepared well for their winter stay – they had considerably more experience with long, dark winters than had their Argentine guest. After the rough rock shelter we had seen at Esperanza, this two-room hut with tidy bunk beds seemed downright cozy in comparison.